Many Rusty Blackbirds spend the winter in West Virginia, so our job is largely to document when Rusties get ready for migration and subsequently leave our region to head north to their breeding grounds. To give you a sense of when peak migratory activity is likely to occur in our area, we’ve posted a list of suggested target dates for each region: http://rustyblackbird.org/outreach/migration-blitz/states-and-dates/ . However, migratory timing can vary annually based on weather and climate, and some Southern states were reporting Rusty sightings into April last year, so any Rusty reports during the Blitz period of 1 March through 15 June will help our effort. CPO Brewer Takes Advantage of an Outreach Opportunity – On February 7, Conservation Police Officer Mark Brewer was checking trout fishermen on Goose Creek in Floyd County and took advantage of an outreach opportunity. He encountered two juveniles, one of whom had caught a brook trout and thought it might qualify as a trophy fish. He measured the fish for them and determined that it would indeed qualify, based on its length. He explained the program to the young men, as well as the specifics for brook trout. Officer Brewer gave the young man a trophy fish award application and helped him fill it out. He also certified the length of the fish for the young man and explained to him the next steps he needed to take to receive his award. Investigation Involving Poisoned Eagles Concluded – On February 11, Senior Conservation Police Officer Troy Phillips and USFWS Agent Mary French concluded a nine month investigation involving poisoned bald eagles in Pulaski County. Four eagles had been found and testing showed they had ingested the drug pentobarbital, which is a drug used by veterinary doctors to euthanize sick animals. The eagles had fed off of animal carcasses taken to the local county landfill and not buried properly. Officer Phillips and Agent French visited vet offices in Pulaski County, interviewed the doctors and found the source of the poisoning. One vet was using his maintenance man to transport frozen animal remains to the county landfill and declaring to the officials working at the weight station that he had dead animals. The officials at the dump did not immediately bury the animals per their policy which allowed the eagles to find and feed on the drugged animal remains. Agent French contacted all parties involved and explained the proper procedure for disposing of the animal carcasses. 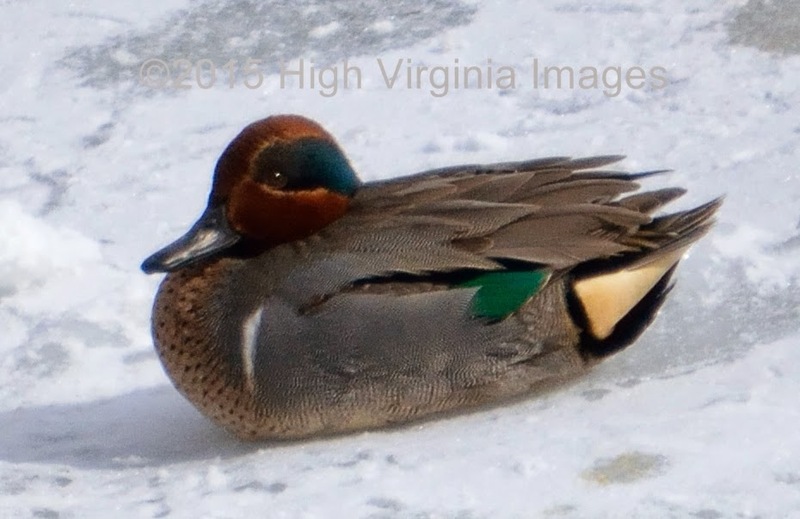 I went duck hunting Sunday and Monday the frigid temperatures and snowfall really narrow your choices as to hunting spots. i carefully planned my trip and with thoughtful planning was able to limit my exposure to sub-zero temperatures. I was able to sneak up on over one hundred and fifty mallards on Sunday and about the same number of Canada Geese on Monday. 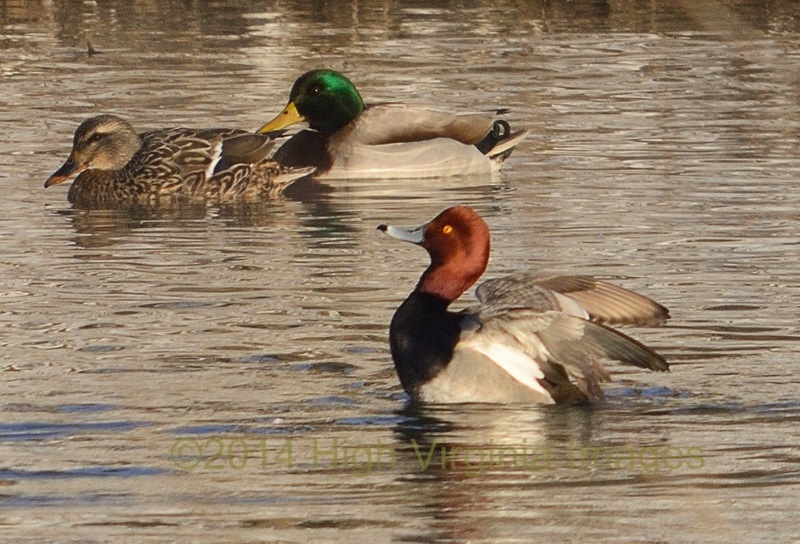 There were a few Gadwalls, Hooded & Common Mergansers and a Green-winged Teal thrown in for good measures. i found a big clump of Cracker Ducks, too. It wasn't very difficult to harvest the variety and numbers I needed to take home. I didn't even get very cold; although I was only wearing Ventilators with wool socks. I didn't have to spend more than about 10 minutes outside to reach my limit. How was I so successful in such a short period of time? I planned well and went to my favorite spot for duck hunting. The local sewage treatment plant. That is where the duck action is. Ducks and sewage plants go together like Old Bay and blue crabs. When I think of all of those real duck hunters out there chomping down on a nice juicy Breast of Mallard; I always think of where the juice really comes from. And Smile. 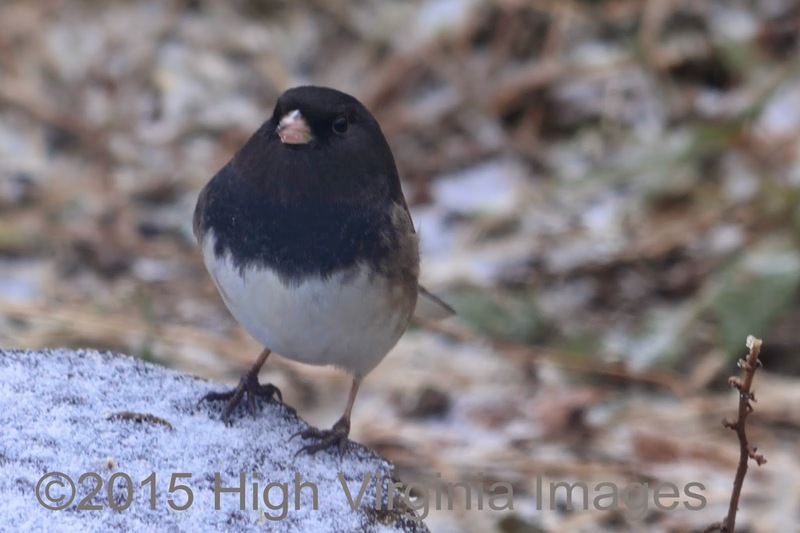 The "Oregon"Dark-eyed Junco has returned to my yard today (2/16/15)!! I saw it on February 10, 2015 and got a few photos through the window. I actually had to stand in a wooden chair to get the window shots from above the screen & steam. Of course the chair broke while I was standing and contorting. 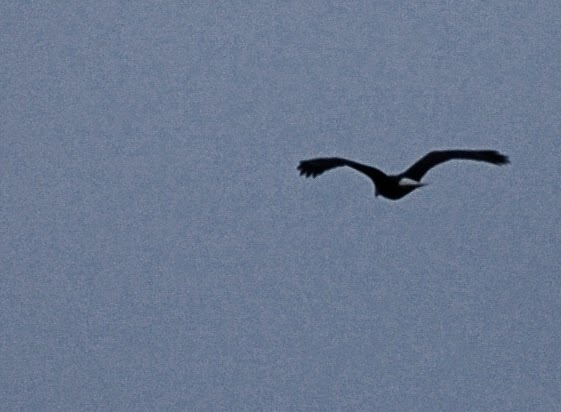 I have looked for this bird everyday since then but could not find it. Today it showed up at about 1 pm in what sandy left of my Spicebush. It flew down on the ground in front of the window and I went after the camera. The pigeons then flew in and scared everything off. I can still see the junco up on the hill about 40 yards away, but it is snowing too hard for any photographic attempts. 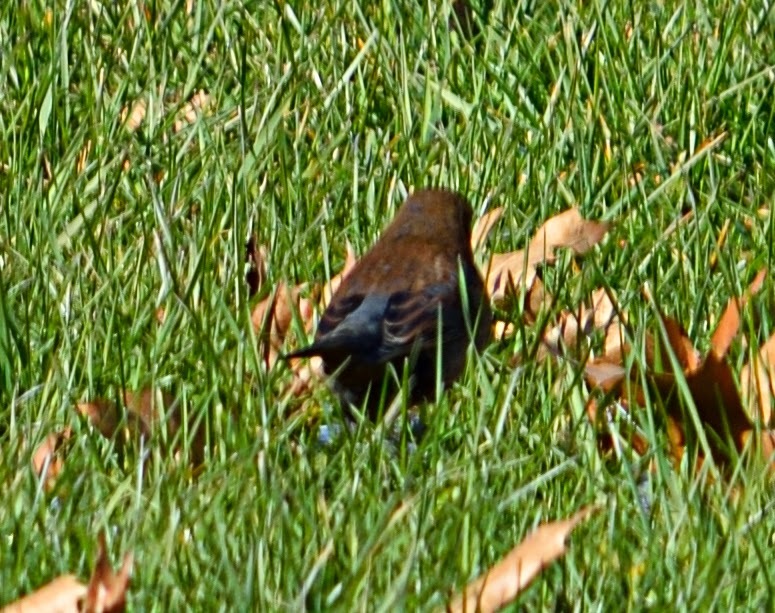 I spent a lot of time looking for this bird over the past week when the sun was out. for now, I guess I'll have to be happy with my window shots. 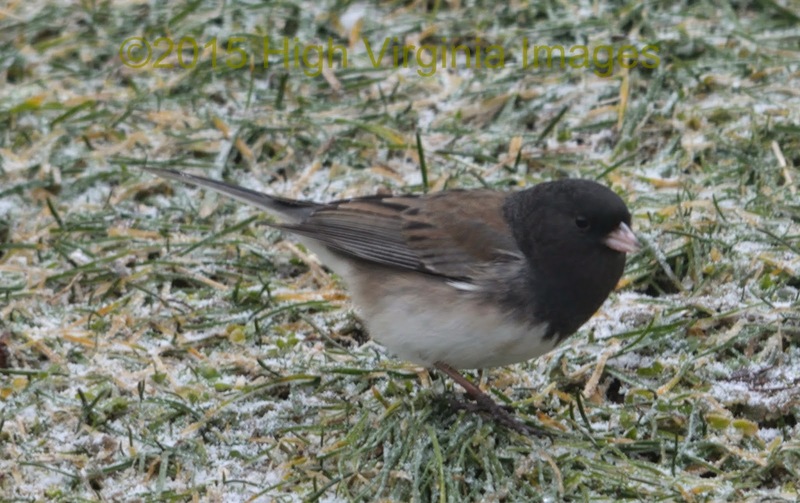 New York, NY, Ithaca, NY, and Port Rowan, ON —Give Mother Nature a valentine this year and show how much you care about birds by counting them for the Great Backyard Bird Count (GBBC). The 18th annual count is taking place February 13 through 16.Anyone in the world can count birds at any location for at least 15 minutes on one or more days of the count and enter their sightings at www.BirdCount.org. The information gathered by tens of thousands of volunteers helps track changes in bird populations on a massive scale. The GBBC is a joint project of the Cornell Lab of Ornithology and the National Audubon Society with partner Bird Studies Canada. Bird watchers from 135 countries participated in the 2014 count, documenting nearly 4,300 species on more than 144,000 bird checklists–that’s about 43% of all the bird species in the world! In addition to the U.S. and Canada, India, Australia, and Mexico led the way with the greatest number of checklists submitted. The Great Backyard Bird Count is a great way for people of all ages and backgrounds to connect with nature and show some love for the birds this Valentine”s Day. Participation is free and easy. To learn more about how to join the count, download instructions, a slide show, web buttons, and other materials, visit www.birdcount.org. While you’re there, get inspired by the winning photos from the 2014 GBBC photo contest. Images available in the newsroom. I just wonder if anyone else has a good place to find an occasional odd bird; that they hate going to? It is the Elkins Flood Control area for me. First off, there is too much traffic and the roads are pretty thin except for the main Georgetown Road. Quite often, there are some shady characters hanging around. What I hate most is that I have Never gotten a good photo there. 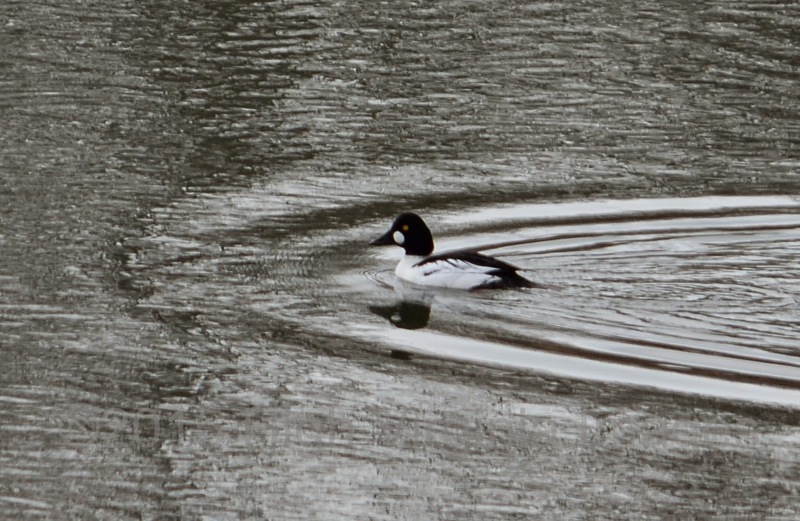 Good ducks are often found in the calm area just above the bridge, There is a deceptive quick, slick current. Everything is always in motion. It doesn't look that way, but it is. You cannot take a photo from your vehicle because of power lines in your face. When you get out and try to take a standing photo, you have to shoot between 3 power lines. Sit down and shoot; you say. I tried that yesterday. By the time you get somewhere cleared of broken beer bottles and used needles; you have to relocate your subject.I took 111 shots of this Common Goldeneye yesterday (2/11/15) and none are decent. This is par for the course at this spot, though. Did I mention that I Hate That Place? Have you heard a squeaky-hinge song lately, or seen a flash of rust-tipped feathers under a bright yellow eye? Although occasionally overlooked as “just another blackbird,” Rusty Blackbirds face an unfortunate and remarkable notoriety: this species has endured a decline more severe than that of any other once-common landbird. 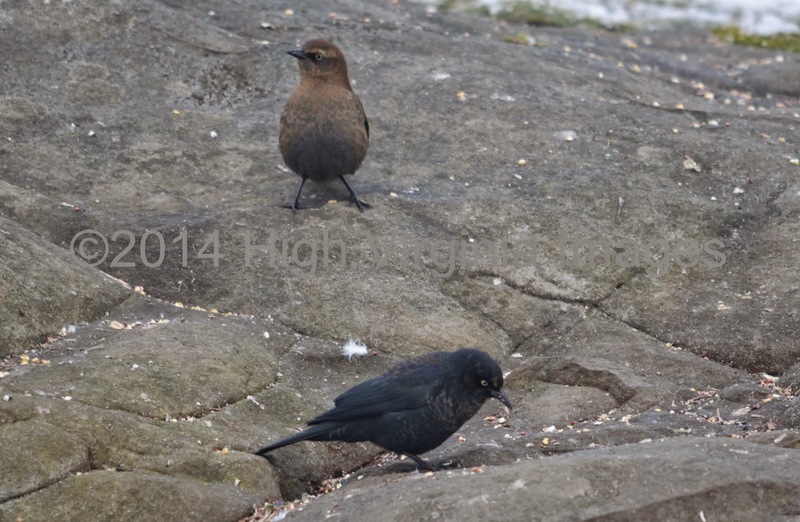 In 2014, the International Rusty Blackbird Working Group, in partnership with the U.S. Fish and Wildlife Service, the Vermont Center for Ecostudies, eBird, and many other state, federal, and local partners, launched a three-year Rusty Blackbird Spring Migration Blitz that challenged birders to scour the landscape for Rusty Blackbirds during this species’ northward migration. Between 1 March and 15 June, 4750 birders submitted 13,400 checklists containing Rusty Blackbird observations to eBird, a hugely successful first season that has allowed us to start looking at potential Rusty Blackbird migratory hotspots, habitat use, and potential migratory pathways. I do not think anything has been as controversial over the years than the presence of Mountain Lions in the mountain state. It has been pretty much agreed upon over the years that the last wild cougar was killed on Leatherwood Creek in Webster County in the year of 1877. The fact that genetically all Mountain Lions (Puma concolor couguar) that reside north of Nicaragua are one and the same. The consensus among the Experts who derive their salaries from either the Federal or State government is that there are no breeding populations of mountain lions in the East; except for in south Florida and possibly northern Ontario. Studies have been done and done again. Same results, every time. Still, nearly every year there are sightings by credible people. I know several who have seen these big cats. If any one of these witnesses told me that they had just seen Snowy Owl at Seneca Rocks; I would drop everything I was doing and drive over for a look. No questions asked. I am not going into the so and so said they saw or heard about someone seeing something stuff. I am going to tell you what I have seen over the years. Some are in WV, some are not. But, all are in the exact same mountain range that runs through here. 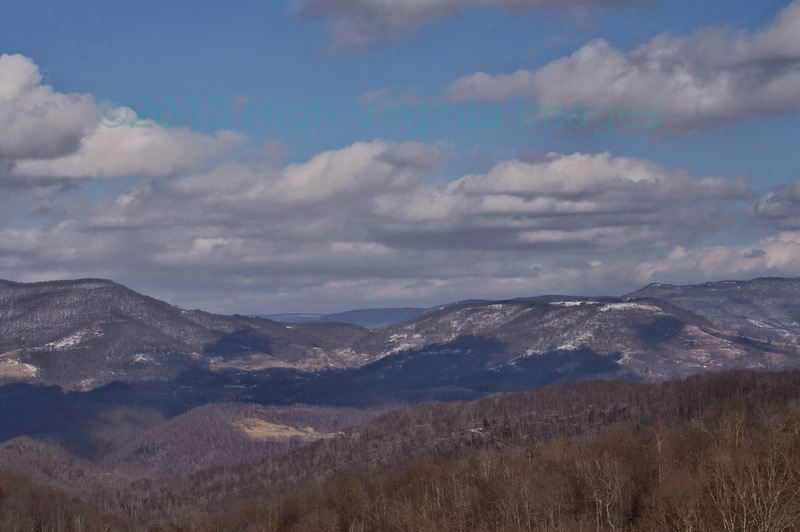 The mountains are the mountains and they are the regions’ highway. It was late September of 1979; I was bow hunting in the Bear Creek drainage of Garrett County, MD. I didn't have much sense back then and I didn't come out on the road I thought I was going to end up on. It was black dark when I hit pavement and of course I didn't have a light. My truck was probably 2 miles away and I started hoofing it. Within about 30 minutes; I had a very strong feeling that I was being followed. I could occasionally hear gravel clicking on the blacktop behind me. I never saw anything, but I had a real strange feeling. There was one house on the road and my truck was about a quarter of a mile beyond the house. I walked by the house, a yellow porch light was on and I could see the TV on. Everything was quiet. I was probably 200 yards past the house when the dog started barking. It wasn't happy to see you barking, either. It was very obvious that something was back behind me in the road that the dog did not want there. Makes the hair stand up on the back of your neck, too, something like that tends to make you pick up the pace a little; even if you are already about used up. I went back into the same area the following spring, listening for turkeys and digging some ramps. There was about 2 inches of wet, melting snow on the ground. I dropped down into the hollow that I came out of that night in September. There they were two sets of tracks. One really big cat with a smaller big (Bobcat) sized one walking side by side. There was someone with me that morning and we followed the tracks down to the stream where they crossed a log. The snow ran out fairly quick going up the other side. Neither of us had to question the other upon what we had just seen. This is my article for the February issue of Two-Lane Livin Part one of three.